In the Rental tents there is space for a maximum of 6 people, and is ideal for the whole family or to stay with friends. They are completely furnished so you can enjoy the holiday starting from the first minute. The Tent cabin offers only two beds and is ideal for two people for a single night during your road trip, or for a short getaway. It is also a fun additional tent for your kids or friends. A barbecue, parasol, heater... it saves so much space it's already on the campsite. Once you cross the bridge you arrive on the island in the middle of the nature, in the Belgium Ardennes. During the low season camping in a Rental tent or Tent cabin is nice and quiet, you will only hear the birds and the rippling of water. Every now and then you can hear a splash from a fish, otter, raccoon or beaver in the river Semois. Ducks and swans are fond of the island as well. 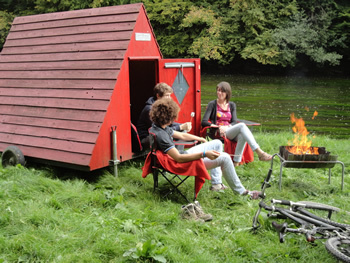 In the evening you can have a delicious barbecue and enjoy the afterglow of a small fire. Of course it is also possible to enjoy a drink in the bar, which is only closed in Sunday during the low season. The friterie is open a few times a week. During the school holidays it is comfortably busy with many families with kids. A lively campsite, kids playing in the playground, young and old frolicking near the waterfront and content guests on the terrace and in the bar. The river is not deep, but it is possible to let yourself float downriver on an air mattress or rubber boat. There is no animation team, but every now and then there are various activities for young and old, and sometimes the campsite guest will help organise them. Dogs are always welcome on our campsite, with a maximum of 1 dog per Rental tent and of course they need to be on a leash at all times. They dogs are allowed to play in the river as well. Across the bridge, just outside the campsite, it is beautiful to walk with your dog. Exception: Dogs are not allowed in the Tent cabin. On campsite Ile de faigneul you can camp in a Rental tent with max. 6 people. The Rental tents are fixed on a platform on the ground, there is a living room and 3 or 4 bedrooms. For your convenience they are situated close to the sanitary facilities (B). The Rental tents have a beautiful surrounding and come with free Wi-Fi. Are you curious about the location of the Rental tents? Check out sites 68 till 71 on the plan of campsite Ile de faigneul. You will also be able to see the locations of the sports field, the playground and the other facilities. On arrival you will find a welcome letter and a welcome package. This way you will be informed about camping in the Rental tent and provided with your first needs. On campsite Ile de faigneul you can camp in a Tent cabin. The Tent cabin is close to the sanitary facility (C). The Tent cabin have a beautiful surrounding and come with free Wi-Fi. Dogs are not allowed in the Tent cabin. De floor area of the Tent cabin is 240x200 and contains two mattresses. There is no electricity, so you will need to bring your own flashlight, sleeping bag, pillows and towels. Are you curious about the location of the Tent cabin? Check out the plan of campsite Ile de faigneul, the Tent cabin is located next to site 125, next to the water. You will also be able to see the locations of the sports field, the playground and the other facilities. The Tent cabin can be used as additional tent and can be moved all over the campsite. The enjoyment of the heat and smells from a barbecue are part of real camping. And when the dinner is ready, you can throw on a piece of wood to get cosy. This is still allowed on campsite Ile de faigneul, but only when this occurs safely. We rent barbecues per day, we also have firewood of 1 meter for sale. You can saw them into smaller pieces on the woodblock. Of course you can also bring your own barbecue if it meets our standards. 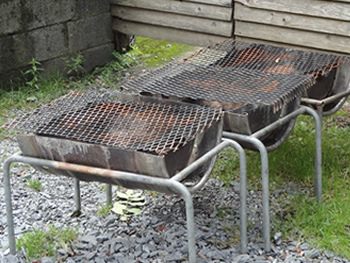 The barbecue has to be on legs and the fire has to be at least 30 cm above ground level. What is not allowed ?!? Fire hive, fire bowl, fire pit, elevation by stones or disposable barbecues. If you have a nice and sunny site, but you would also like some shade for your kids, yourself or your dog, you can rent a parasol (including the base) at the reception. In the low seasons it can be chilly at night, and turning on the heater can make you more comfortable. 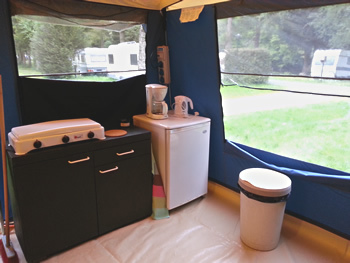 You can rent an electric camper-heater which has a guard when accidentally falling over.